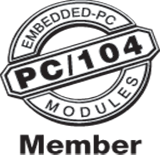 PC/104’s rugged capabilities and small form factor made it a preferred solution in defense (including onboard vehicle control and navigations systems), transport, and industrial control. Despite challenges posed to PC/104 from other architectures offering high computational performance within Small Form Factors (SFFs), PC/104 continues to flourish because of its flexibility in military and other rugged vehicle applications. It delivers high performance combined with low power, stackable configurations, MIL-STD compliance, as well as meeting key industrial and transportation standards.